We know about this! 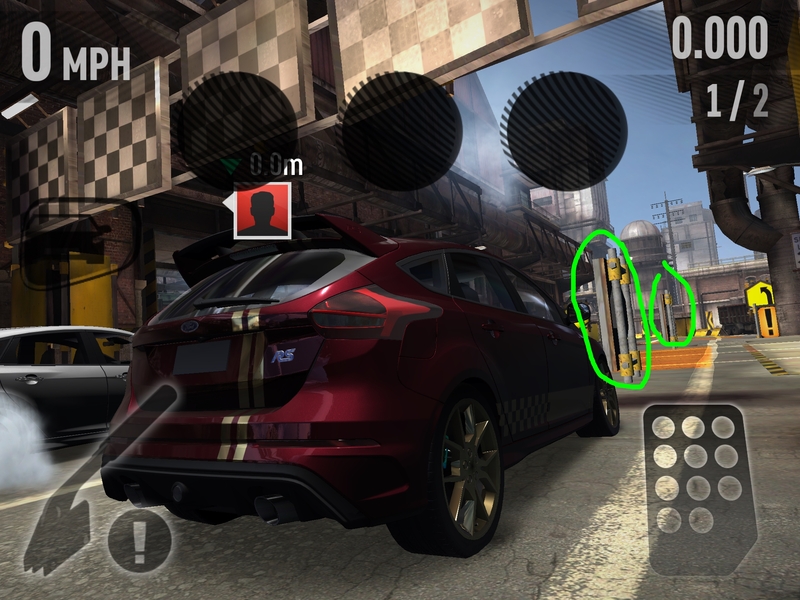 The handbrake markers are automatically placed depending on your car and upgrade stats, the problem is sometimes they get placed in the middle of the track! It's on the radar though Larry! That's the Fo8Large track I think, a personal favourite! It's really fast and intense! I was wondering what those things were. I saw them on every track yesterday. I am still seeing them in this new Steel Workers League. I have repeatedly remarked about the large accruals of cash on all the races win or loose; the only person to acknowledge this information is LarryDLegend. I make observations about the different cars I am racing so you will know how they perform; the only one who notices and replies is El Mutro. I give my thoughts regarding the tracks I am driving on, guess what? No one eye one word. If you are not interested in any of my input or feedback, please have enough respect and tell me. I will just continue to play this game with out continuing to bother you by offering my opinion. A few days ago I received a message I was promoted to level 2. I have many times for someone to explain the reason and significance of this promotion. I still have never received an answer to my question. I got the last blueprint piece for the gold Subaru. It fully upgrade this new car. In case anyone is interested, these are my observations. The car hugs every turn, without any sway or bobble. It has been raced on the Oval and the Figure 8, with I think great times 43.200 approximately. I raced 12-15 people on each track; I lost the 1st race on both tracks. It always takes me one or two races to get the feel of the track. Every race after that I won. The Subaru gold is not as fast as the Mach 1, but for performance and maneuverability it can't be beat. Just in case Hutch is awake and paying attention to my remarks. I am really getting frustrated. Hummingbird, I am sensing your frustration and am right there with you. I understand that this is a holiday weekend, at least for us here in the states, that is, but the lack of response from the Hutch team about issues is starting to get frustrating, to say the least(see my drunken rant in today's tournament thread). If this unresponsiveness were simple a holiday issue, then I could accept that excuse. But I made these comments and concerns days ago. I can not get their attention no matter how many time I say it. Hummingbird, when you got the last piece of the gold Subaru was it stock or fully upgraded? I appreciate you informing me that this is a UK holiday. Unfortunately I made comments and asked questions, and voiced concerns, before this holiday began. It was stock; I did the complete upgrade myself. Would either of you care to comment on the time this car got on both the Oval and Figure 8 tracks this morning? Your time on the Oval is the fastest I've seen. I smoked a 42.907 on the Figure 8 with my "CHASER"